Hi everyone, I’m very happy to have come across this forum, you seem to be a very helpful bunch! 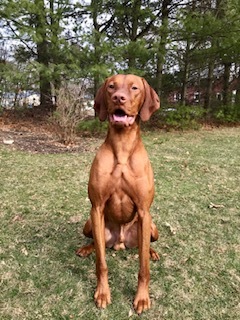 My wife and I have a 2.5 year old male vizsla Calhoun, and I’m hoping that perhaps someone here can offer me some advice. 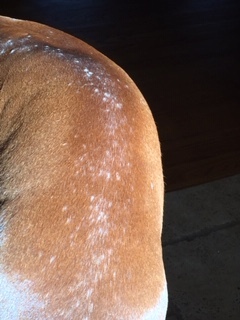 Calhoun periodically has, since he was around a year old, had bumps/hive looking patches on his back that turn to dry flakey looking spots with associated hair loss. Sometimes it skips the bump phase and sort of moves directly to hair loss patches. Occasionally, and more recently, he’s gotten these small patches on his head as well along with puffy red eyes. He’s been to the vet many times as a result. We, along with our vet, pretty much came to the conclusion this was all caused by environmental allergies, but no treatments really ever seem to do much to make them go away, they seem to come and go on their own. I had thought the pattern was seasonal, but this fall and winter here in Rhode Island (we’re in the US), they’ve really hung around. Our vet has prescribed antibiotics, prednisone, apoquel, over the counter allergy meds like Benadryl and Zyrtec, along with medicated shampoo. Sometimes he’s itchy, though mostly he’s not really...when he is the apoquel seems to help. I’ve pretty much stopped with the meds at this point and stuck with regular bathing as I never saw a notable difference in anything with the meds. I’ve wanted to find a good holistic vet or attempt a holistic approach to managing his skin condition, but haven’t had any luck finding a reputable holistic vet in our area or a good source of information on what is causing Cal’s issue. Our vet is really wonderful otherwise, I just think they haven’t seen this sort of condition before. I’ve included photos taken today of Cal’s back in direct sunlight so that you can see what we’re looking at. 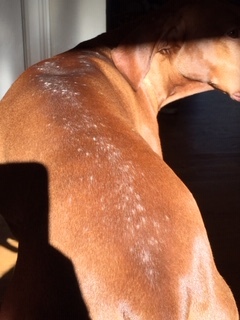 I’ve googled Cal’s condition ad nauseam, looking for help, and finally came across http://www.vizslahealth.net/sebacious-adenitis/ last night, which links to this forum and really opened my eyes to the possibility of Cal having sebaceous adenitis. The early picture of Tucker looks just like Cal’s back. I still don’t know if what I’m looking at is sebaceous adenitis or skin allergies, but I’m open to and very appreciative of any insight you all can provide. Pictures of Cal’s back below along with one of him looking happy and handsome for good measure. I have no experience of Sebaceous Adenitis. There are some posts about it on the forum and you can do a search on the main page. I expect you have tried to find out the cause. It can be very difficult and time consuming though so I think it helps to make a diary and also to try and do some eliminations. For example, try taking him somewhere different to play for a time. Also check out any plants in your garden - it is amazing how just rolling on a plant can cause allergic reactions. Then there is indoors - what carpet shampoo is used or floor cleaner? It may not seem a lot, but it could just be something that tips the balance. Have you had Calhoun's thyroid tested? Skin issues can be caused by a low thyroid. Are you avoiding flea treatments etc.? It is a long process trying to find out allergies, sometimes. My, what a handsome boy Calhoun is! Thank you for his picture and also the pics of his condition. Generally, skin biopsies taken from multiple sites is the way to achieve a definitive diagnosis of SA but, given that Vizslas can be genetically predisposed to Sebaceous Adenitis (SA) and Calhoun appears to have a typical SA skin presentation, it is therefore most likely to be the problem with Calhoun's skin, so the question is, do you have several biopsies done or treat speculatively for SA? As Calhoun is on prednisolone the results of the biopsies would probably come back as inconclusive and would not give a definitive diagnosis. In the past most conditions of this kind were treated with immunosuppressive doses of steroids and perhaps cyclosporine and retinoids with antibiotics, to address secondary infection. There is nothing wrong with this treatment, but if there is an effective, alternative drug that doesn't cause such severe side effects as steroids then, when treating a non-life threatening disease, perhaps this should be considered. There are some immune mediated skin diseases that respond well to Doxycycline (or tetracycline) and niacinamide, with the addition of high doses of essential fatty acids (known to be 'steroid sparing') with Natural Vitamin E. Doxycycline is a drug in the tetracycline antibiotic group of medicines, but for the treatment of skin disease it is used for its anti-inflammatory and immunomodulatory properties not for its antibacterial properties. I have known numerous dogs with an autoimmune skin disease that effects the nails (called SLO) that have been treated with Doxycycline and niacinamide, and many supplements, and have reached remission without the use of steroids. Take a look at the websites below. The DVM 360 website is a marvellous resource when it comes to treatment of all dog ailments and because it is veterinary based and gives treatment options with dosages, you can take this info to your own vet with confidence. I realise this is a lot of reading but it will familiarise you with the condition and allow you to have frank discussions with Calhoun's vet so together, you can make the right treatment choice for Calhoun. SA is a chronic skin disease and the aim is to bring it under control, as opposed to getting a cure, but it can be done. Catherine - thank you so much for the reply and suggestions. Jo - Those were extremely helpful links, I have an appointment to discuss with our vet today. I'll follow up here with our approach and results to hopefully help others in the same boat with their pups. Thanks again, I'm relieved to have found folks that can provide some insight here. I'll follow up with our approach and results to hopefully help someone else out in the future.